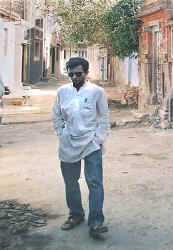 "FREEWHEELING ON A STILL NIGHT"
AN INFORMAL SITUATION REPORT FROM THE HEART OF BHUJ, ON FEBRUARY 20, 2001. I'm sitting at a computer on a table on a tarpaulin sheet on sandy ground under a makeshift tent -- the "Computer Centre" at the Abhiyan Relief Camp here in Bhuj. I've been here for a few days; I came to review what's happening to historic buildings here and to touch base with several friends I'd made (when we were here doing a regional plan for Kutchch, commissioned by the Gujarat government) who've taken to tents because their houses have fallen. There's a smell of bleach in the air, to counter the stench of corpses still under debris in the old city. They dug out a little boy yesterday down the corner from the Abhiyan Relief Campus (the network of 14 aid agencies with whom the organization I work with as an urban planner is associated). Trapped in a bathroom, he drank tap water for three weeks and survived. It was a mountain of steel, concrete and iron above him and they still got him out. We watched a bit of it, like tourists. It was very theatrical; voyeurism actually of a very reassuring sort. The entire neighborhood had turned out to watch him being rescued; there was a clutch of Tibetan monks in vermilion on the top of the mound, with prayer wheels. Someone in the crowd decided to turn back to the crowd and conduct a "bhajan", a hymn, and at first it was like listening to an aria at an open-air music festival, as though one should actually enjoy it. And then several people joined in. I'm tired tonight. it's 12:30 am on the 20th but I couldn't sleep so thought I'd connect with you and tell you that all's well at the epicentre here in Bhuj, though we had a bit of a scare this morning at 8:45 am when there was a tremor of 5.2 on the Richter. Fascinating how Bhuj's residents don't seem to mind their town being shaken up any longer; they simply go about their business day to day. There's a smell of bleach and dust in the air, constantly. It's the same sort of smell you'd get if you walked into a funeral home where bodies were being ritually washed prior to embalming. Warm sweet smell. The men from the Muncipality come around every morning and evening and spray the streets with what looks like Johnson's Baby Powder -- on everything. Absolutely fascinating. Sorry if this sounds macabre, but one has to be honest; there isn't much of a break from being honest through the day -- one sees so much destruction that one gets used to honest displays of mangled, tortured fabric -- an entire city which looks like some 1950s Hollywood McCarthyian film set of a city bombed. And through it all the people of Bhuj remain impassive, even cheerful, sitting outside their porches on hastily improvised sofas chatting with neighbours, or serving others at the food distribution centres that are being managed by the Swaminarayan Mandir Trusts. Absolutely extraordinary organization, this. They feed 12,000 people every day for free; you just line up with your paper plate under a shamiana to have it heaped high with one vegetable, some rice and dal. And you can come back for seconds. They're all so polite, smiling, calm, all those people who've suddenly lost their houses, and you'd never know it. I asked a psychologist at the camp what it was; she says it's mass shock. I thought I was in shock, but obviously my situation pales in comparison to Bhuj's residents'. I was told the other day that I was suffering from a mild case of Post Traumatic Disorder: my stomach's been out of commission for 15 days and I have trouble sleeping; but I can't be compared to these people. There are tents outside everyone's porches in neighborhoods where houses still stand.